I'm going to keep it brief today because after 10 days in Norway visiting R's family, and then 10 more days split between Denver and Chicago visiting mine, well, I'm tired. (Posts on each trip, with recipes of course, will be coming along eventually.) 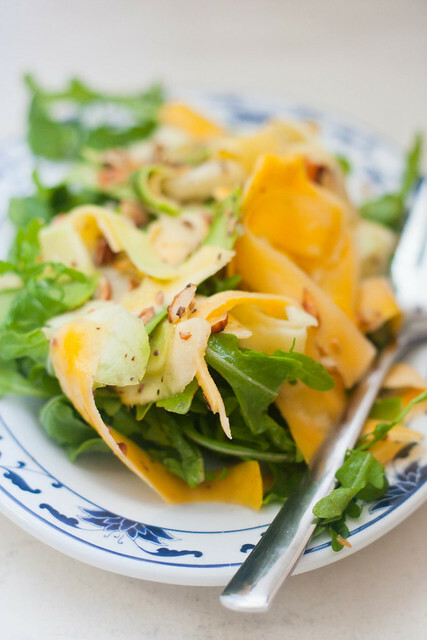 If you're tired too, maybe from mid-summer's heat or from too much vacationing, there's nothing easier than a shaved summer squash salad for a healthy lunch. You're just going to use a vegetable peeler to shave ribbons off of summer squash, which you will then dress with a lemony, garlicky vinaigrette. No cooking, no unnecessary heating of the house or apartment. If you plan on eating the salad over the course of a couple of days, store the dressing separately, and only add it to the salad as you eat it. Use a vegetable peeler to peel ribbons off of the squash until both are completely shaved into strips. Set aside in a large bowl. In a small bowl, whisk together the oil, lemon juice and garlic. Season to taste with salt and pepper. 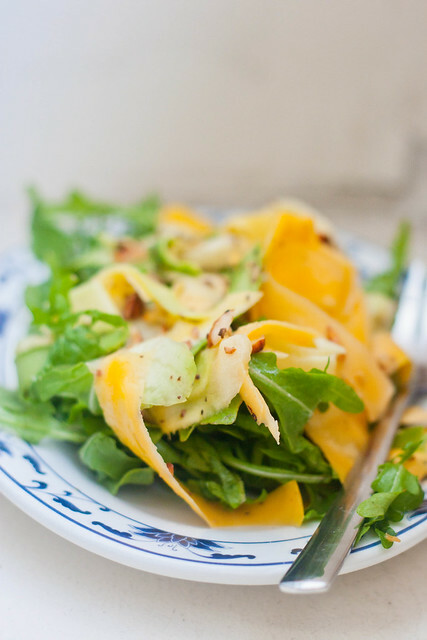 To serve, toss the squash together with the arugula and dress with the vinaigrette.